UGREEN USB VGA KVM Switch allows you to share one USB keyboard, USB mouse, and VGA monitor to control 4 computers.It is designed for multitask with four computers at your convenience, increasing productivity in the office or at home.So you can easily switch between 4 computers using a manual switch located on the top of the KVM switch box. Press the manual switch button to switch between the four computers. Please make sure the VGA Input Connector 1 and USB B Connector 1 were plugged in the same Host. Every VGA IN and USB B IN is corresponding. Please Do NOT use VGA IN1 and USB IN2 mixed insertion. 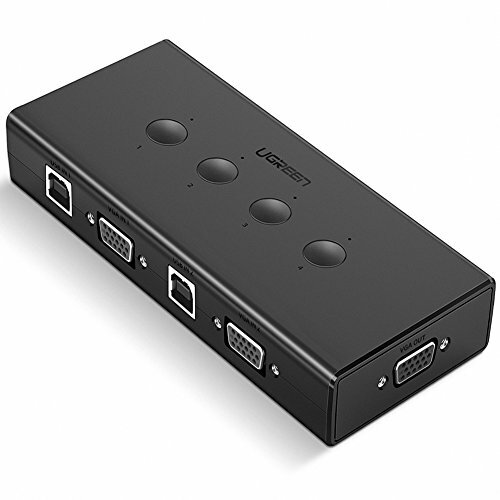 UGREEN 4 Port USB KVM VGA Switch Box: allows you to control 4 computers with only one set of controls and display screen (mouse and keyboard). It is great for workstations, test stands or anywhere multitask between computers is required. Conveniently for you to control multi computers and provides a cost-effective way to share one USB keyboard, USB mouse, and VGA monitor to 4 computers at the same time. Portable and Easy to Use: 3 USB Type A connectors, 4 USB Type B connectors, 4 VGA IN connectors and 1 VGA OUT connector. The 4 In 1 Out VGA KVM Switch between four computers is controlled by the push button on the top of the unit. 4 USB Type B connectors support not only for data transfer from the printer but also for the extra power supply. So you do not need plug any power into the vga switch box. 1080P Full HD Higher Definition Output: UGREEN USB KVM switch supports high-definition image and supports maximum resolution up to 1920x1080@60Hz, backup compatible with 720P, 480P. Please note this VGA switcher only transfer video. For audio output, please directly connect your speaker to the 3.5mm interfaces of computer/PC. Good Compatibility: Windows 10/8/7 / XP / Vista (32/64-bit), Mac, Linux, Sun Solaris, DOS, Win3, WINNT, Netware, and Unix. The VGA Switcher Box also supports online games and DVR. Plug and Play: no power supply, or software needed. Providing Free Specialized Installation Guide and Excellent After-service: You will not only get this 4 PORT USB KVM SWITCH you ever need, but also lifetime Guarantee and Friendly Customer Service. Important Note: Please make sure the VGA Input Connector 1 and USB B Connector 1 were plugged in the same Host. VGA IN1 and USB IN1 is corresponding. Do NOT support VGA IN1 and USB IN2 mixed insertion.